The only real race center in the Greater Vancouver Area. Heavily used for Drags and NHRA races. 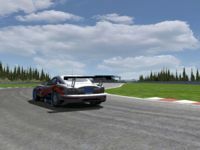 As well, The SCCBC Racing League uses the Road course. All manners of open wheel Formula racing for the up and coming. The original training grounds of the late great CART driver Greg Moore. Also a MX track is on site. -proper corner marshals, complete with Porta-Potties. -greatly improved realism all around. Working in Tandem with an actual skilled modeler has payed off. EVERYTHING is new. Entire track redone. You will hardly recognize it since the overhaul. Massive improvements in track detail and the entire grounds. Fully ready for night racing as well. ---Huge Thanks to "Neteye" for helping me make this happen. This track is truly accurate and ready for racing!!!! There are currently no setups for Mission Raceway. Add a Setup. The AIV Roadster, designed around the time when most American production cars were not renowned for their handling characteristics, was a breath of fresh air to many. Sorry man but it never works. There's an error in the archive, 6 files are missing, so I am told. Great track, thanks for updating it. All I can say is, if you like it so far, the next release will take it to the next level. Keep an eye on this one for updates!! !